Comments: Princess Leia Organa disguises herself as the bounty hunter, Boushh, to sneak into Jabba the Hutt's Palace. Once inside, Leia frees Han Solo from his carbonite casing. Her actions, however, are anticipated and Jabba captures Leia and forces her to become a slave. 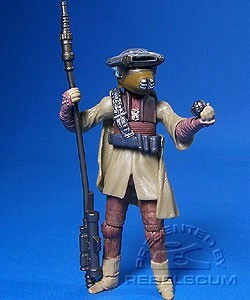 Princess Leia (in Boushh Disguise) is a repack of 2006's TSC Princess Leia (in Boushh Disguise).